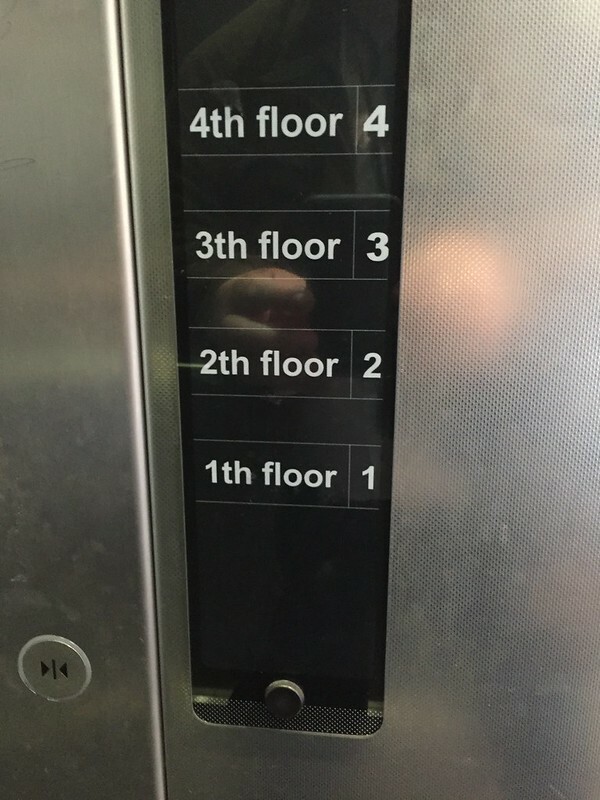 Honorary elevator man Scissorhead Baron von Beavis wants to know to which floor IN HIS BUILDING you would like to go. von Beavis assurs us that the entire bank of elevators has this signage. 11 Responses to Bad Signs, Cont. The contractor had a lithp. the 2th shall set you free..
Firtth! Firth! ‘Cuz I’m number oneth! I think I went there oneth. “Maid in China” – Cheep! Someone’s been to Trump Tower. Alison – it is vonBeavis taking the picture. He is wearing black, the pink-ish thing is his hand, and his phone is black. If you look closely you can see his shoulder in the upper left. Thank you! I’ll pass that along.